Segue Resources Ltd (ASX: SEG) says it has found two “significant bedrock conductors” at a magnetic target within its Plumridge Nickel Project in Western Australia’s Fraser Range. 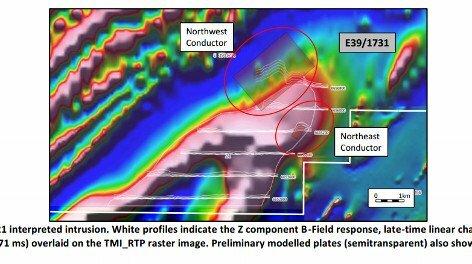 In June, SEG discovered a very large magnetic anomaly at its Fraser Range nickel tenements called E21 and has commenced an exploration programme to find what else is in the ground. The discovery of two new bedrock ground EM conductors came as SEG appointed the geological con-sultancy OMNI GeoX to manage its exploration programme in the Fraser Range alongside its present operator Newexco. OMNI GeoX has been involved in the discovery of several major nickel resources including Nova-Bollinger, a nickel and copper deposit that propelled its owner Sirius to a market valuation of nearly $1BN. The E21 target is one of five that were identified by SEG at Plumridge and is being explored as a test case for the project. SEG is hoping to identify a significant nickel deposit that will underline the value of the tenements. The programme to explore the E39/1731 block in which E21 is located is SEG’s main focus. The E21 feature is roughly 25km2 covering the southern end of the E39/1731 tenement. SEG says E21 is transected by the axis of the Fraser Range with gravity high and major regional structures parallel, and in close proximity to the Nova Structure – a large area of nickel prospects in the Fraser Range. SEG says it believes E21 has all of the hallmarks of a very large mafic/ultramafic intrusive body, similar to the “eye” which hosts the Nova-Bollinger nickel deposit that propelled Sirius to a market valuation of nearly $1BN. SEG estimates that E21 could be several orders of magnitude larger than the Nova-Bollinger deposit and survey results will either confirm or disprove this theory. SEG has been acquiring tenements across the Fraser Range for some time and grouping them into a project called Plumridge. Part of this was a JV with International Goldfields Limited (IGS) but SEG recently bought out ISG’s stakes, acquired 100% control of four tenements and upped its stake in E39/1731 to 80%. SEG initially acquired a 65% interest in the four tenements for $100,000 in cash and the issue of 50 million shares. It has now acquired the remaining 35% interest in the four tenements by the payment of $200,000 and granted IGS a 1% net smelter royalty. Plumridge is about 120km north-east of the Nova-Bollinger deposit and covers about 2,200km2 with 100km of strike length. Upon purchase, SEG acquired high resolution aerial magnetic data and has been reviewing the information allowing it to identify five magnetic targets including E21. SEG is conducting a 2,000m Aircore drilling programme and electromagnetic surveys on its E39/1731 tenement with the focus on a feature called E21. SEG says that an initial reconnaissance Ground (Moving Loop) Electromagnetic (MLEM) survey over the E21 target at the Plumridge Nickel Project identified two significant bedrock conductors. The MLEM survey was undertaken by Segue’s geophysical consultants, Newexco, which completed six lines with an initial spacing of 800m over the E21 target. Newexco says modelling of the data collected so far indicates two conductive horizons on the northwestern and northeastern margins of the target. It says the NW conductor is both strike and depth extensive with an extremely high amplitude response on one of the MLEM lines. Newexco says it will now acquire infill MLEM to ensure blanket coverage of E21, including extended margins to east and west. This will allow comprehensive modelling of the identified conductors. SEG lodged a Programme of Work with the Department of Mines and Petroleum for an AirCore drilling programme to commence at E21 in mid-June 2014. But now the two new bedrock conductors have been identified, SEG has amended the programme request and says it anticipates approval to be received by mid-July when drilling will commence immediately. In addition, SEG has engaged Thomson Aviation to acquire high resolution aeromagnetic data on its E39/1731 block to bring its data up to the same standard as the rest of the Plumridge Nickel portfolio. Work is scheduled to begin during July 2014 with data processing completed in August. Following processing of the aeromagnetic data on E39/1731, Segue will carry out its “stage-gate” exploration programme on any “eye” targets it has identified. OMNI GeoX appointed as geological consultant SEG has appointed OMNI GeoX as its geological consultant for the Plumridge Nickel Project in the Fraser Range. OMNI GeoX will take the lead in providing management for SEG’s exploration activities including conducting the company’s maiden air core drilling programme at the E21 Target, where two bedrock ground EM conductors have just been identified. OMNI GeoX is a specialist consultant group and is led by Managing Director Peter Langworthy who was previously Executive General Manager for Exploration at the highly successful nickel explorer Jubilee Mines Limited. His company will work alongside Newexco to firm up the nickel resources SEG has at its Plumridge prospects. SEG’s Managing Director, Steven Michael, says these two leading nickel sulphide exploration consultants will provide the expertise to discover the next nickel deposit in the Fraser Range. “Prior to establishing OMNI GeoX, Peter Langworthy was instrumental in the discovery of a series of high grade nickel deposits with Jubilee Mines, which was acquired in 2008 by Xstrata for $3.1BN,” he says. SEG says its Technical Director, Dr Howard Carr, has resigned from the company to pursue other interests. SEG announced its board would like to thank Dr Carr for his contribution over the past 10 months, including the implementation of the initial exploration strategy and programme at the Plumridge Project. To pay for this new round of exploration SEG has been raising funds from its existing institutional and private investors. $589,000 was raised through an SPP to private shareholders that issued 78,533,285 fully paid ordinary shares at 0.75¢ per share. In addition, SEG’s specialist microcap investment fund, Acorn Capital Limited, agreed to raise its underwriting committment to the SPP from $375,000 – $500,000 and immediately satisfied the move with a share placement. Acorn now owns 10% of SEG’s issued capital. In addition to the new source of funds through share placements, SEG has also secured a voluntary agreement from its major shareholder N&J Mitchell Holdings Pty Ltd to escrow all of its shares in SEG until the 13th of December 2014. This means 33.1% of SEG’s issued capital is now tightly held, providing a strong base of financial stability for its accelerating nickel exploration programme in the Fraser Range.